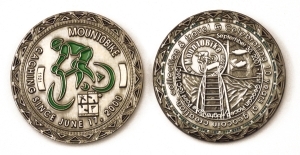 This is the current version of the Moun10Bike Geocoin. It was designed to commemorate the 10th anniversary of geocoins, specifically the placement of the first geocoin in the wild on September 30, 2001 at the now-defunct "Light House Point" cache (GC126C). The reverse features a rendition of the rickety aluminum ladder that once led up to the rocky promontory and an image of the original Moun10Bike Geocoin that was placed there. Two hundred of these coins have been minted by DirectMint.com, and they are not for sale or trade. They are distributed only by placement in caches.